KUALA LUMPUR, April 17 — Caretaker Deputy Prime Minister Datuk Seri Ahmad Zahid Hamidi today said the government will use various measures introduced by the government to contain fake news online during the 14th general election. He said the government's efforts to neutralise fake news is not a tool to silence dissent or control freedom of speech but to counterbalance the dangers of fake news. “Malaysia will hold its 14th general election, precisely three weeks from now. This is the time where some describe as a crazy season. “This is the period where we shall witness news, and fake news being digitalised, networked and automated… please bear in mind that it is not a tool to silence critics, neither it is meant to go against the freedom of speech and freedom of the press,” he said in his keynote address at the closing ceremony of Putrajaya Forum 2018, held at the Matrade Exhibition and Convention Centre, here. 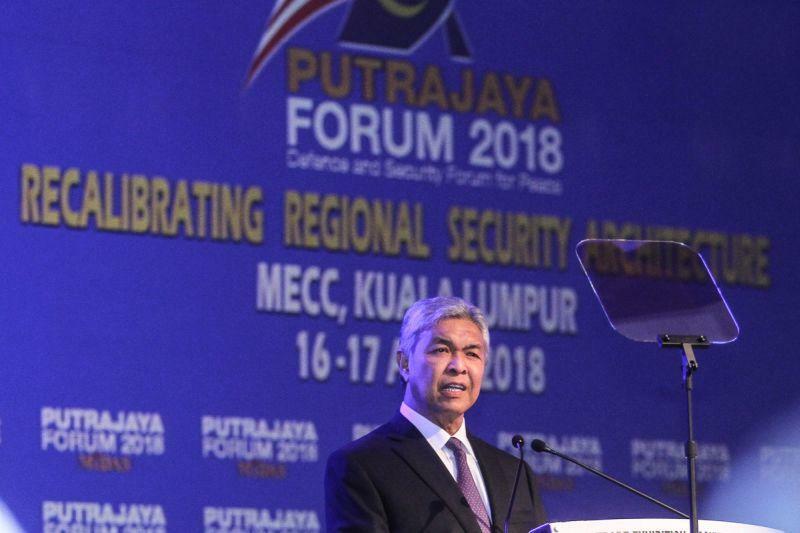 Zahid said the measures taken by the government should not be seen as denying users their freedom in using the internet and social media platforms. The caretaker deputy prime minister said the intention is to educate the public to be responsible internet users and not fake news mongers. “In the context of national security, the rapid emergence of new technological advancement posed a greater threat to cyber dimension. This is among the major challenges that all security agencies have to deal with at present, and for many years to come. “We are living in an age of cyber dependency, or if I may say that we are living in an era of cyber insecurity. Cyber threats in the past few years have vaulted to the top of many governments’ list of concerns,” he said. The Anti-Fake News Act 2018 was passed in the last parliamentary sitting and gazetted on April 11. A person convicted under the proposed law can be charged and slapped with a fine up of to RM500,000 or jailed up to six years, or both. Putrajaya Forum 2018 attracted more than 1,000 participants from over 45 countries, namely Asean dialogue partners and invited countries. Organised by the Malaysian Institute of Defence and Security, the fifth biennial international discourse consisted of four sessions with a total of 14 speakers, which touched on the issues revolving its theme, “Recalibrating Regional Security Architecture”.